An orthodontist will recommend braces to improve a patient’s “orofacial” appearance through a number of orthodontic treatments. These orthodontic treatments treat problems such as crooked or crowded teeth, overbites, under-bites and incorrect jaw position. If left untreated, these problems can result in a number of problems, such as tooth decay, gum disease, headaches, earaches, as well as speaking, biting or chewing problems. Orthodontic treatment can transform the appearance and function of your smile, leaving your oral health in an envious position. The average cost of orthodontic treatment is dependent on the type of treatment you receive. For example, Invisalign treatment is more costly than traditional braces. Furthermore, the cost of orthodontic treatment is dependent on the situation of one’s oral health. You might be thinking, excuse me? With the introduction of revolutionary orthodontic treatments such as Invisalign, you can now improve the appearance and function of your smile without receiving braces treatment. Invisalign treatment consists of using a series of nearly invisible, removable aligners that straighten your smile little by little over a specified time frame. The aligners should be worn day and night, except when eating, brushing or flossing teeth. The aligners should be changed every two weeks for a new set of aligners to ensure your teeth are given the support necessary to move them into their desired position. Traditional braces consist of metal brackets and wires that work by applying pressure to your teeth, adjusting them to their desired position over time. Modern braces are smaller and less noticeable than the notorious “metal-mouth” braces that many adults remember. Traditional braces are a cheaper, yet effective form of orthodontic treatment. As mentioned, Invisalign treatment consists of a series of 18 to 30 custom made, clear plastic aligners that are removable and replaced every two weeks. Although Invisalign treatment possesses a number of benefits which include their almost invisible appearance and the ability to remove them when eating, drinking, brushing and flossing, they will not work for serious dental problems. Moreover, Invisalign treatment can be quite costly and take longer to improve the appearance of your smile. Clear braces, also known as ceramic braces are the same size and shape as metal braces, except they use tooth-coloured or clear brackets that blend in with your teeth. Clear braces are much less noticeable than traditional braces, although they generally come at a higher cost and are prone to stains. 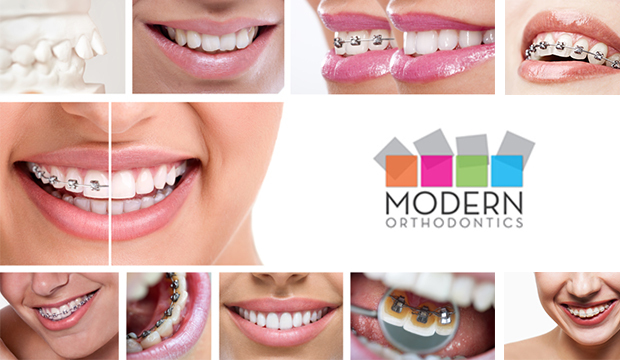 For more information on these services, or to book a consultation, please contact Modern Orthodontics today.